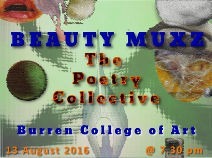 The Beauty MUXZ was conceived by poets Patrick Stack and Arthur Watson as a tribute to poet Peter Kay (RIP) who was a valued member of The Poetry Collective during his erstwhile six-year sojourn in Ennis, Co. Clare prior to his death. Peter himself made an altogether unexpected appearance during rehearsals through the medium of a recording of one of his poems to the astonishment of all present. We interpreted this as his way of giving us his posthumous approval. The slideshow comprises a selection of famous, not-so-famous, and unknown works of art of various forms from throughout human history and was put together by Arthur Watson and Patrick Stack. The soundtrack was put together by Patrick Stack. It comprises snippets from over 60 pieces of music and spoken word sampled at random from his music library and woven together. Directed by Arthur Watson and recorded by Carmel Doherty.